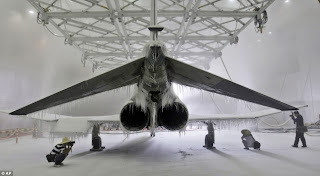 Pictured: The frozen fighter jet tested in icy conditions.. . in South Korea ! 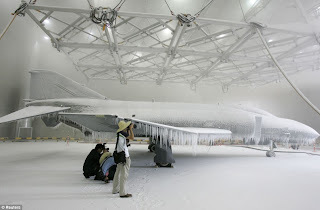 Beneath its frozen shroud is the sleek shape of an old Phantom war jet. 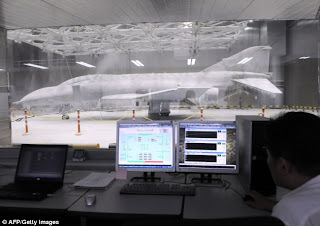 The F-4E Phantom fighter stands in the climatic chamber of a £30million aerospace test centre in Seosan, South Korea. Largely secret, the facility's doors were thrown open so South Korea could show off its advanced technology. The equipment measures the operational capabilities of the country's military planes and vehicles in extreme weather conditions. The chamber's freezer bars can create the environment experienced by a plane at 40,000ft. Visitors were invited to watch the process of a Snow and Freezing Rain Test at the 188,000-square- metre facility, after it was opened by Defence Minister Lee Sang-Hee today. The £30million project to build the facility was established in 2003 with the help of Boeing, which offered related technology in accordance with its contract with Seoul on the sale of 40 F-15K fighter jets. Most of South Korea's 700-strong air force, including their 80 F-4E fighter bombers, are American designed. South Korea shares a hostile border with Communist-run North Korea. There has been long-standing animosity between the two regions following the Korean War from 1950-1953. Although South Korea has the 25th largest population in the world, it has the sixth highest amount of active troops. However, on October 4, 2007, former South Korean President Roh Moo-Hyun and North Korean leader Kim Jong-il signed an eight-point agreement on issues of permanent peace, high-level talks and economic co-operation. Scientists were giving away no secrets with the aircraft, however. 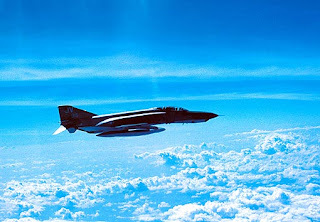 The F-4 Phantom first flew in 1958.